BETTY M. IS SYMPTOM-FREE FROM PARKINSON’S. CONGRATULATIONS BETTY M. OUR NUMBERS ARE GROWING, ONE-BY-ONE, DAY-BY-DAY. In July, I was contacted by Betty about coaching. Our first call was Monday, July 29th. She had started the Parkinson’s Recipe for Recovery®, and we had much to discuss. In our conversation, I went into great detail regarding the mental/emotional/spiritual aspects of the recovery. I stressed that it is a soul, mind, and body recovery, not just a “doing Qigong exercises” recovery. Betty understood Qigong and meditation, and it resonated with her. She was going to see her acupuncturist the following day and then she was going out of town for a week. I mentioned to her, as I have mentioned to many of you, if you are going to see an acupuncturist, please have the acupuncturist do something complimentary to the Recipe. Many acupuncturists follow the Western view of Parkinson’s, and they stick needles in people’s heads presuming there is a dead part of the brain. I recommended that the acupuncturist work on Betty’s liver meridian and kidney meridian to help strengthen them and help open blockages. Betty sent me emails while she was traveling explaining remarkable improvement in her symptoms. When Betty and I next spoke, she began our coaching session by telling me that she was my shortest coaching client…she was symptom free. It was incredible! She wanted me to wait to make the announcement, and last night, she let me know, she remains symptom free and is confident she has defeated Parkinson’s. She told me it was okay to write a post about her recovery. About 8 years ago, I began having problems with my legs. I was bumping into things because my legs felt weak and I didn’t have good balance. This level of leg problems continued for a few years, until it began to be more pronounced about 3 years ago. I asked my doctor if he could tell me why my legs were so weak and my balance was not good. He put me through all kinds of tests. Nothing showed up so I asked him if I could take physical therapy. This seemed to help as my muscles became stronger. But the good effect soon wore off. I fell a couple of times, which worried me. So, thinking I needed to get my legs stronger, I signed up with a personal trainer at the local health club. Instead of getting better, my legs got weaker and stiffer. I began to shuffle instead of walk with a strong stride. My handwriting became terrible; I couldn’t hold a pencil. My voice began to slur, I had very low energy and tired easily. A friend of mine suggested maybe I should go to a neurologist, so I made an appointment for Feb. 27 of this year. When I showed him my symptoms, he diagnosed me with non-shaky Parkinson’s Disease. I was floored because I had no tremors. I had an MRI to rule out anything else. He prescribed Requip. I took the medicine for a little over a month but it affected me so badly, I could hardly function. I quit taking it. He then prescribed Sinemet. I took one tablet and was so dizzy and “out of it,” I never took another one. I decided not to take anymore Parkinson’s drugs. I continued to get worse. My shuffling got so bad that I started using a walking stick. My voice was getting weaker. I had to rest after doing the simplest chore. My handwriting became unreadable. I started doing a lot more exercise, as recommended. I added many vitamins to my regime. On a trip to visit my family in July, I felt like a 95-year-old (I’m 71), feeble and very, very slow as I hobbled around using my walking stick. I took a lot of naps. I continued to surf the Internet’s Parkinson’s sites. 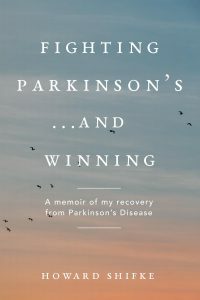 One night I happened to find http://www.fightingparkinsonsdrugfree.com/ and was shocked to find someone who was HEALED from this “progressive, degenerative, incurable disease.” Howard’s message and method immediately resonated with me. I have belonged to a meditation group for several years so the Qijong exercises and meditation were not strange to me. I downloaded the Recipe for Success and began the recipe the next morning. I had also started taking acupuncture and continued to do so. That was a Sunday – July 28. I spent about an hour each morning that week doing the exercises. I had an acupuncture treatment on Tuesday. On Thursday, a friend of mine said that I seemed to be walking differently. I had kind of felt it too but thought it was my imagination. But it wasn’t. The next day, I realized I had no problems with my balance. My walking pace and stride were faster and longer. By the weekend, I felt my energy level restored. I said if I can hold the pencil to do a crossword, that’ll be the clincher. And I could hold the pencil. I had to assume that I had been healed! What a feeling, I can’t describe it. It was like being released from a prison life term. I really don’t know why it took me such a short period of time doing the Recipe because I certainly do not consider myself “special.” I can only think I was so ready for relief from this awful disease. Doing the Recipe was a “no-brainer” – no meds involved, no strange herbs or vitamins, no cost! I did the Recipe with positive, meditative intention and constantly told myself I had the power to heal myself. I visualized dopamine flowing. I visualized myself walking. I can only think the mental/spiritual/emotional aspects of healing myself all fell into place. I think too that there was a “method” involved (the Qijong is easy to do, but you have to know which exercises will help your specific problem) and I would never have figured it out myself. Howard, with his specific background and understanding, was able to put it all together and I can’t thank him enough for sharing his experience. Congratulations Betty M!!! And, thank you for sharing your recovery journey with all of us. We are inspired! “I have the power to heal myself.” And I did. “You have the power to heal yourself.” Marie did. Pratima did. Now Betty M. has. And you are. “Together we have the power to heal the world.” One-by-one, day-by-day, our numbers are growing and we are recovering! You can reach full recovery, too! Yaaaaaaaaaaaahhhhhhooooooooooooooo! The tide is turning. My tide is turning. Thanks to Betty. And BIG, ALL TIME thanks to Dear Howard. Rather: Saint Howard. Wonderful news, Betty! Congratulations! Those of you who have recovered continue to inspire the rest of us! Thank you! That really is fantastic news! Congratulations, Betty!!!!!!!!!! What wonderful and inspiring news, Betty! Congratulations and huge gratitude for the fullness with which you shared your journey to recovery! congratulations Betty. we all are happy for you. Such wonderful and inspiring news! Congrats Betty and thanks for sharing. Congradulations Betty! Just the most wonderful news for me to hear. This brings such hope and inspiration to carry on with my recovery. Betty, CONGRATULATIONS ! Words cannot express the greatness of this news….And thank you for sharing with us…..it means so much !!! What a breath of fresh air for all of us that another has beaten this terrible disease. Congrats Betty. Wishing it was as quick for all of us, we know the recipe works and it’s just a matter of time as long as we stay dedicated and keep learning how to heal our body, soul and mind with Howards direction. Absolutely awesome news, Betty. Thanks for sharing. It gives us all renewed energy and inspiration to walk “The Road to Recovery” and ultimately, to be cured. You must be high on life about now! Wonderful and inspiring news.Well done Betty! We are all on the same path to recovery……..Thankyou Betty for the boost of motivation! Like a shot in the arm! Thank you dear Howard for making this miracle possible for each of us! Thank you for the congratulations everyone. It is definitely a “high.” You’re all right about Howard – he’s a gift! I had been meditating about my “leg problem” for a long time. But the problem persisted. When I found out I had Parkinson’s, I meditated about “getting more dopamine.” I tried to eat foods that would produce dopamine. I said over and over to myself, “I’m producing more dopamine, I’m producing more dopamine.” It took someone like Howard to put together that we were working from the wrong premise. We already had dopamine! It was just blocked. And the Qijong exercises and acupuncture simply helped remove the blockage. So, yes, my healing was quick. But I had been already meditating on healing for years; I was just asking for the wrong thing. So, keep that energy flowing and the blockages will be removed for you too! Thanks for your inspiration, Betty and congratulations! You are truly blessed to have recovered so quickly! How long were you getting acupuncture before you started the Recipe? I only had a few sessions. I went weekly and now every 3 weeks or so. excellent news! every person who is healed helps everyone else to be healed. May we all be healed! Congratulations, Betty! what wonderful news! As another who followed the Recipe and recovered, I am so happy to be on welcoming committee in “Recoveryville”. This is a fabulous place to be! Your sharing your journey will certainly be an inspiration to others; with each of us who recovers, the message “YOU HAVE THE POWER TO HEAL YOURSELF” becomes stronger, more undeniable. Now there are four of us! …and make full recovery from Parkinson’s a reality for yourselves too. Again, Betty, my heartfelt congratulations to you!!! I’m so happy for you! It shows how at all ages it is possible with a lot of faith. Well done! Wow! How inspiring. Thanks to both Betty and Howard for sharing this incredible news. One day I hope to share the same news too. It reinforces my belief in recovery. What a victory for both of you. Congratulations Betty! I have been hoping more of us would recover. I think that you may have started a recovery trend that will have more and more of us recover. What wonderful news! How encouraging for us all. So happy for you, Betty, and for Howard, who works so hard to help, this is another wonderful validation. Have to own up to some envy on how quickly you recovered, but mostly thrilled. Congratulations Betty M! How extremely exciting. How very inspiring. And Howard, thank you so much for giving us the tools for liberation. Your generosity is outstanding and deeply touching and healing. Blessings. Betty….Congratulations!!!! I am so happy for you. Thank you for sharing your personal experience with us. You are a great inspiration for me and everyone who is fighting PD. Congrats Betty, We all are inspired to keep going on our journey. On behalf of Michal I want to thank the fortunate and persevering Betty M. and her colleagues in Recoveryville, and everyone who has posted a positive and cheering message that I can pass on to Michal. Michal and I are awaiting Howard’s return from wherever so we can proceed with coaching. Meanwhile I shall forward an optimistic message inspired by the present blog so as to extricate Michal from the doldrums. Good luck to you all and blessings for your good health and rapid recovery!